Highlands End Holiday Park offers superior self-catering accommodation providing both caravan holidays as well as lodge and apartment breaks. All self-catering properties are available to rent throughout the year with weekly breaks starting on a Saturday and short breaks beginning on Friday or Mondays. 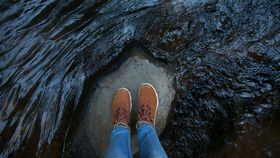 The best thing about Highlands End Holiday Park is that everything you need is on the doorstep. 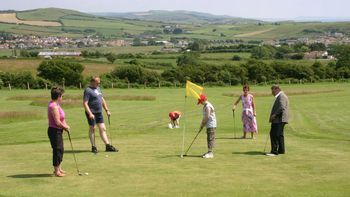 There is a swimming pool, tennis courts and a pitch ‘n’ putt course onsite, ideal for guests who enjoy an active break, plus there is also an onsite grocery shop offering fresh produce. When you don’t feel like cooking, the onsite bar/restaurant and coffee shop are perfect for drinks, snacks and meals. Eype beach is just 500m from the park allowing guests to enjoy incredible views of the coast and easy access to Dorset’s best attractions. 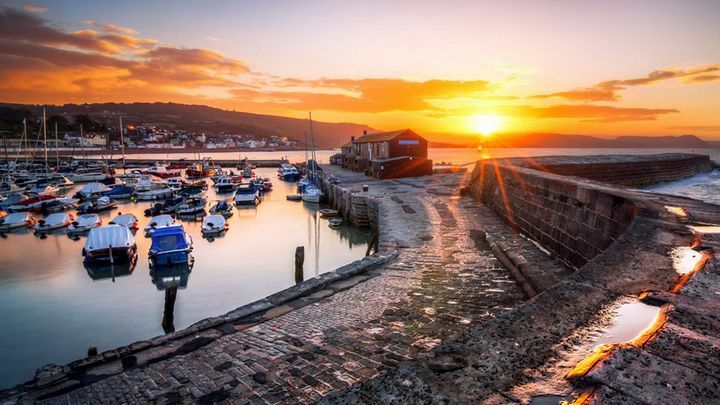 Highlands End self-catering accommodation is set atop a coastal cliff overlooking the incredible Jurassic coast. It is only a short 500m stroll down to Eype beach from the park. The beach consists of large smooth pebbles and provides the perfect spot for a BBQ by the waves. Highlands End Park boasts a wonderful leisure club with a large swimming pool. The resort offers adult only swim times as well as fun sessions and swimming lessons for children. The centre includes a steam room and a sauna. Martin’s bar and restaurant serves breakfast, lunch and dinner – perfect for when you don’t feel like cooking. The restaurant includes a beer garden and an enclosed children’s play area. 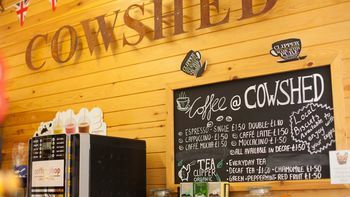 The Cowshed Coffee Shop is another onsite option serving up a slice of great views, hot beverages and delicious cakes. Highlands End has a hard-base tennis court available for guests to use free of charge. Rackets and balls are available to hire from the park reception desk, advance reservations are recommended. Highlands End has a 10 acre, 9-hole course with incredible views of the Jurassic coast. Clubs, putters and balls can be hired from the park reception desk. Highland End is a five-star luxury holiday park in Dorset. 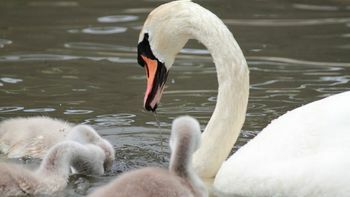 Providing a quality selection of lodges, caravans and apartments as well as a great selection of onsite facilities, Highlands End is a premier provider of Dorset family holidays. A popular walk from Highlands End is via the South West Coast Path. 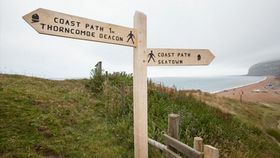 Head down to Eype beach and follow the path across the clifftops down to West Bay covering a modest 2.2 miles. For a lengthier walk continue until the Hive Beach Café and reward yourself with a spot of lunch! Take a tour underground through the incredible man-made caves which were originally carved to collect Beer Stone for cathedrals around the country. The tour takes an hour to complete where you’ll hear all of the fascinating history behind the tunnels. Monkey World rescues abused or neglected apes from around the world and gives them a home for life at Monkey World in Dorset. 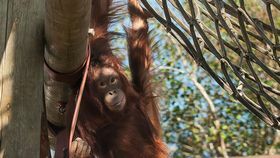 The primates live in family groups and guests can come and observes the fascinating antics these cheeky chimps get up to. 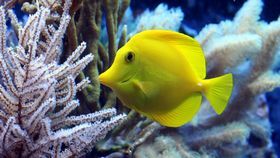 Head to Lyme Regis to visit the Marine Aquarium where you’ll learn about the areas maritime history and get to meet some fishy friends and fascinating creatures from the depths. For 10% off the price, book your tickets online in advance. There are loads of fantastic restaurants to try in Bridport, get quirky and visit The Station Kitchen (built within a train!) serving a delicious contemporary style menu or head to The Riverside Restaurant for incredible seafood. Alternatively, Hive Beach Café is perfect for lunch by the beach. Our self-catering Dorset accommodation is near many attractions such as Chesil Beach, Abbotsbury Subtropical Gardens and Durdle Door. A little further afield you’ll find the Dorset Waterpark at Corfe Castle which is always a great day out. Just 3 miles down the road is the Bridport & West Dorset Golf Club, where you’ll find an 18-hole course set upon the clifftop, looking out across the Dorset coast. For a faster change of pace why not try a thrilling RIB charter from West Bay, a fast exhilarating ride covering 6 sea miles. Fed up of rowdy kids and inconsiderate tourists? Find your happy place as you discover the best beaches in Cornwall for some well deserved peace and quiet, and your own space on the sand. Bring your best pal on holiday this year and make the most of your experience helped by our handy dog friendly guide to Cornwall. It's inevitable that even the warmest holidays will have a day or two of rain. Find out how to spend them with our guide to Cornwall's best wet weather attractions - you won't even miss the sun!